Bupposan Tozanin Hodenji Temple is very close to Gyotoku Station of Tozai Line so it is near the crowded shopping district. Hodenji Temple is quietly appeared in the street. Since it had got disasters several times, there are some modern disigned buildings in the site, only statues of Enma Daio (The Great King Yama) and Datsuiba (an old woman robbing clothes from dead people in the land of the dead) exist. 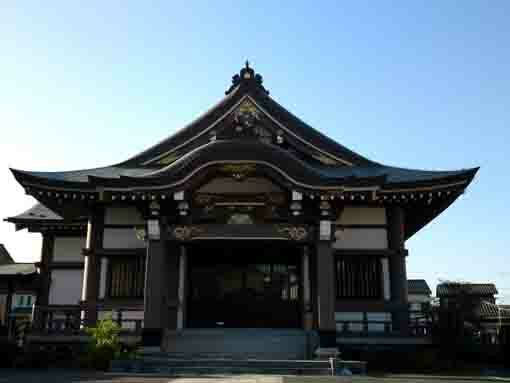 Moreover, Bupposan Tozanin Hodenji Temple is the 22nd temple of the 33 Pilgrimage in Gyotoku and Urayasu. Why don't you visit Bupposan Tozanin Hodenji Temple? Bupposan Tozanin Hodenji Temple was built in 1553 by the venerable Kanryu. It is a branch temple of Shiba Zojoji Temple in Tokyo, one of the Grand Head Temples of Jodo Sect and it is the 22nd temple of the 33 Pilgrimage in Gyotoku and Urayasu. The framed writing hung on the main hall built in 2002 was written by his honor Yuko Narita, the 87th abbot of Zojoji Temple in Shiba. And the framed writing hung on Kannondo was written by Shusan Ota, the 80th abbot of Shojokein Temple in Kyoto, one of the Grand Head Temples of Jodo Sect. 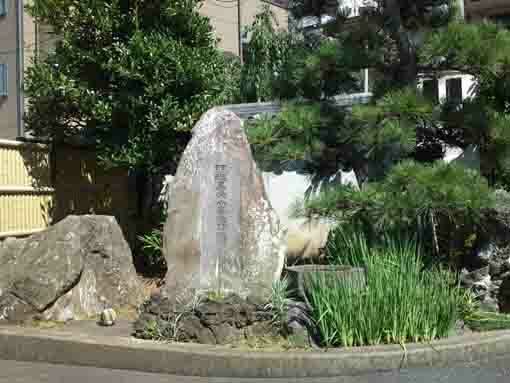 There are stone monument of the Meitoku Elementary School in Gyotoku and stone statues of Enma Daio and Datsuiba. Bupposan Tozanin Hodenji Temple has a great accessibility from both Narita and Haneda International Airport. From Narita International Airport, take JR Sobu-express line, transfer the line at Nishi-funabashi to Tozai line of Tokyo Metro bound to Nakano or Mitaka, get off Myoden Sta. And also take Keisei-line, transfer the line at Funabashi to Sobu-Local line, and transfer the line at Nishi-funabashi to Tozai line of Tokyo Metro bound to Nakano or Mitaka, get off Gyotoku Sta. It takes minimally 60 minutes from Narita Airport. From Haneda International Airport, take Keikyu-line bound to Narita, transfer the line at Nihonbashi to Tozai line of Tokyo Metro bound to Nishifunabashi, Tsudanuma or Katsutadai, get off Gyotoku Sta. From Tokyo (Otemachi) Sta, take Tozai line of Tokyo Metro bound to Nishi-funabashi, Tsudanuma or Katsutadai, get off Gyotoku Sta. From Akihabara Sta, take Sobu line bound to Chiba, Tsudanuma or Nishi Funabashi, transfer the line at Nishifunabashi to Tozai line of Tokyo Metro, get off Gyotoku Sta. Take 5 minute walk from Gyotoku Sta.